On the last day of the Summer Holidays Tori and Arthur were very excited when the postman delivered a HUGE parcel – they were even more excited when I informed them that it was actually theirs. 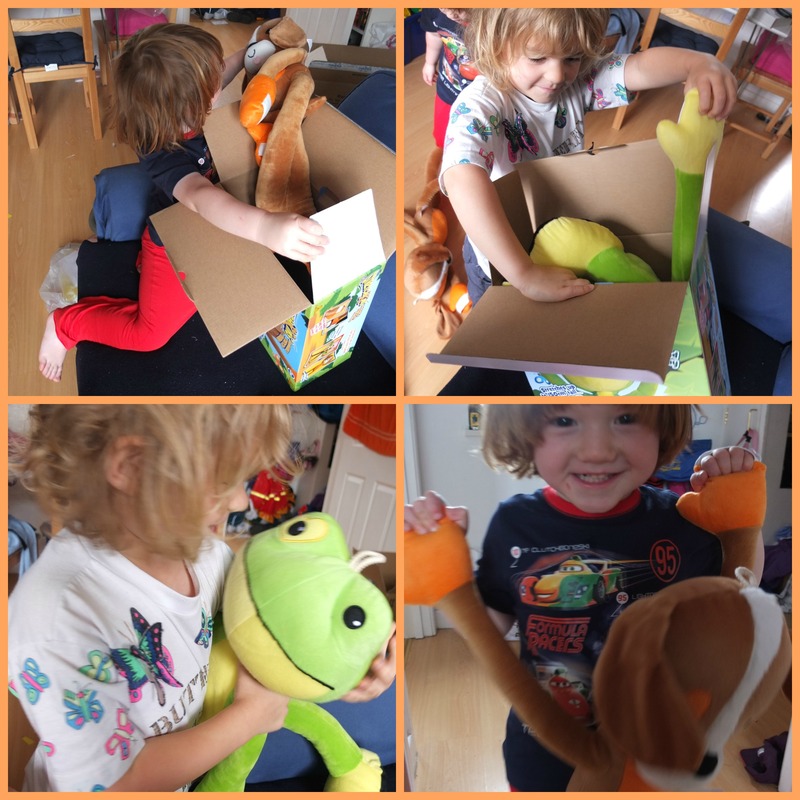 Inside were a pair of Stretchkins all ready to come out and play – Arthur chose the dog and Tori the frog and they had them out of the boxes in seconds, grinning from ear to ear. 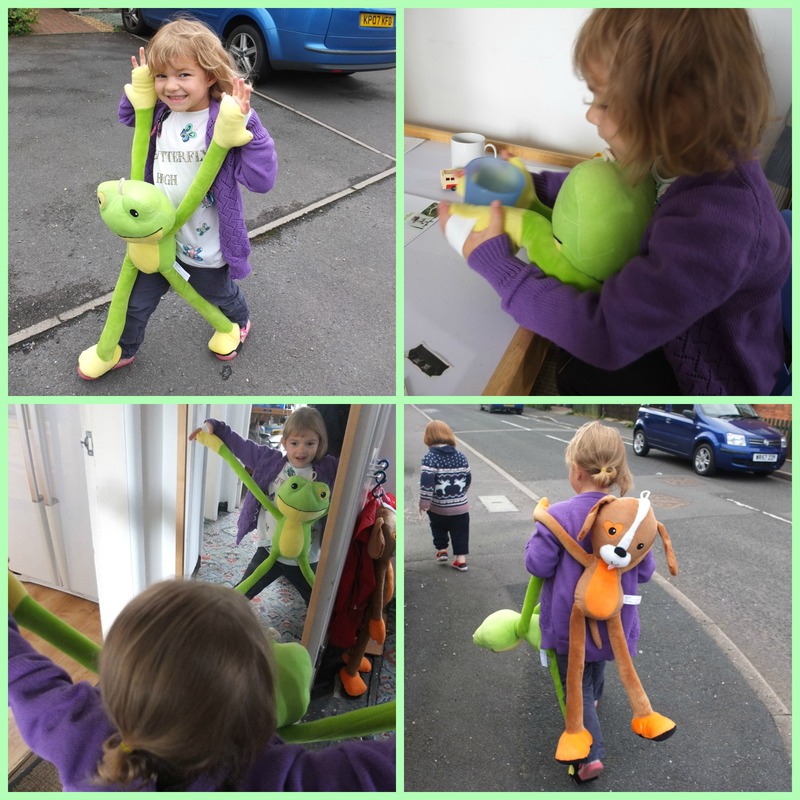 The Stretchkins are big, stretchy cuddly toys with elastic on their hands and feet so they can walk, dance, run and play along with your child. Arthur’s dog is about the same size as him when they stand side by side, which he thought was great. 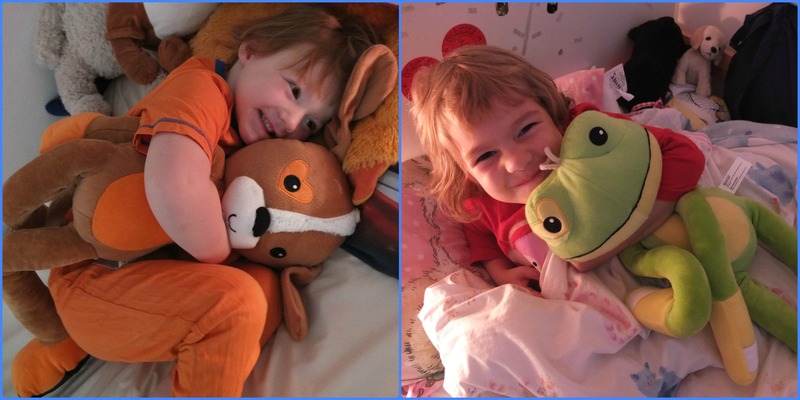 Both Tori and Arthur ran around with their Stretchkins and even insisted on taking them with us when we walked to a friend’s house – Arthur carried his but Tori walked the whole way with her frog on her hands and feet. She got lots of smiles from passing cars and people we passed commented on how funny and cute she looked. I loved the way the Stretchkin moved as Tori walked, swinging its head from side to side as it strode along with her – its head turned the right way whenever she lifted her hand to wave too. Tori thought it was hilarious and giggled her way down the street. We played board games at our friend’s house and Tori insisted on Frog joining in too – sat on her lap she used his hands attached to hers to roll the dice on his turn. She danced in front of every mirror she passed all day and when Arthur said he was too tired to carry his Stretchkin home we could even use the hand elastic to hang him on Tori’s shoulders for a piggy back home! Tori sat her Stretchkin in her bookcorner to read with her, Frog and Dog have played with Arthur’s Cars and Trains and have sat at the table for breakfast with us. I think though, the biggest sign that Stretchkins have been a hit is that both Tori and Arthur have insisted on having them in bed every night since they arrived – if that’s not a seal of approval then I don’t know what is. The elastic on their hands and feet seem durable – there is very little sign of wear on them after a couple of weeks of play including being worn outside. The elastic did seem a little too strong/tight at first but it soon fitted their hands and feet perfectly after a little while of use to ease it in. The Stretchkins are very cute and cuddly and can be played with in lots of different ways – they come in four different characters: Frog, Dog, Elephant and Pink Unicorn so there is something to suit every child’s taste. Suitable for children 3+years they are great for encouraging little ones off the sofa – they are such fun in the way they bop and move around that it is hard to resist larking around with them. You can buy Stretchkins from Smyths, Argos and Amazon with an SRP of £19.99. We were sent two Stretchkins in return for an honest review. No other payment was offered or received.